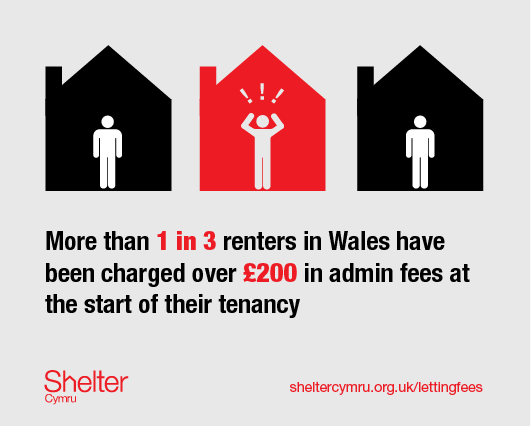 1 in 4 renters in Wales who have used a letting agency have been charged excessive fees. Right now letting agents can charge renters whatever they want, on top of the fees that landlords pay them already. We think it is time for action. Fees are business costs, and they ought to be paid by the business or the landlord, the one profiting from the business of renting. Some have been charged admin fees as high as one month’s rent plus VAT – and that’s on top of paying for the bond and rent in advance. We won’t stop until we Make Renting Right in Wales. You can help us Make Renting Right. If you have ever dealt with a letting agent, please complete our survey and tell us more about your experiences. We want to know about hidden costs and prices you’ve paid. Let’s put a stop to letting fees for tenants in Wales.